First, sorry il the thread already exist or is not relevant. -> A similar tool for galaxies would be just outstanding. I have just created (tomorrow!) 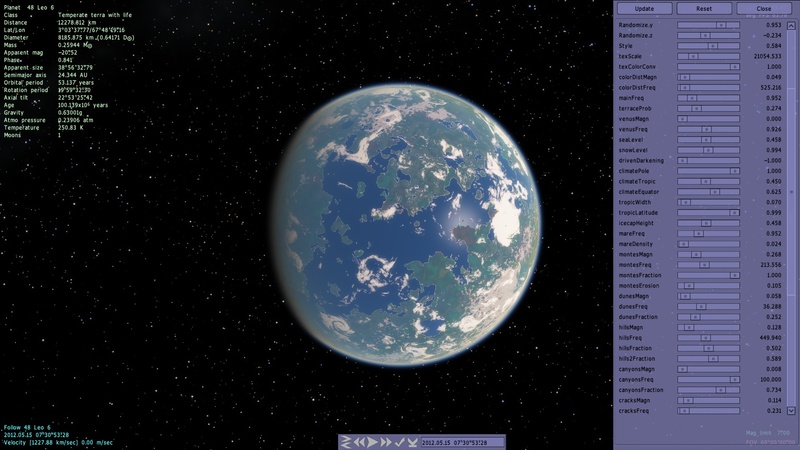 something like a planet editor - this is a tool for debug, but can be extended to useful planet creator. But I should note that it is impossible to edit a procedural planet - as changes cannot be saved. The only way to make a new planet in SE is to add it to planets catalog. But such a tool can be used to "save" any procedural planet to the script to make a catalog based on it. Saving a system to the script is already implemented in a previous version. SpaceEngineer, that is awesome! This would make a wonderful addition to SpaceEngine. I concur, that would be brilliant to eventually have in SpaceEngine. Even if it's impossible to save on procedural planets. Too bad for procedural planets. But yeah, a tool as you showed could be great (and easy to use), with a button "export to script" ! how do you get this planet creator? Build a time machine and travel to the future and get .96 release. If you cant do that then the best option is to do what ther es of use are doing.